For a majority of us, craft beer and outdoor adventuring go hand in hand. But the two biggest threats to our hoppy brews out on the trail are temperature and freshness. Contrary to popular belief—changes in temperature won’t affect a beer but warm beer just really isn’t all that enjoyable. A loss of freshness in beer, on the other hand, can be debilitating—destroying flavor and carbonation and offering a rather unpleasant experience to the imbiber. In the last few years, outdoor companies have started to address this issue by designing larger, reusable water bottles that are being marketed as “growlers” but are all of these products going to keep your beer fresh and frothy until you reach your destination? Testing is required, but a few of the new growlers look like they could be just the thing for effective, safe transport of beer into the backcountry. Touted as the “world’s first vacuum insulated beer growler, the Hydro Flask 64oz. Growler is made of 18/8 food grade stainless steel and features a screw top lid, and utilizes double-walled vacuum designed to keep your beer cold for up to 24 hours. Screw top lids can pose a threat to freshness, but claiming that this growler will keep your brew cold for that long lessens the impact. Available in 40oz. and 64oz. variants, the Klean Kanteen Classic Growler will feature their “Swing Lok” lid which seals the bottle quick and tight, limiting the amount of stale air that gets trapped in the bottle. No claims on how long the brew will stay cold are being made, but being single-walled—it’ll be limited. Additionally, Klean Kanteen is offering the “Swing Lok” lid as an accessory which can be retrofitted onto their classic bottles. Being a company that only offers one bottle and it’s a growler, DrinkTanks hits our list with their 64oz. Stainless Steel Growler. 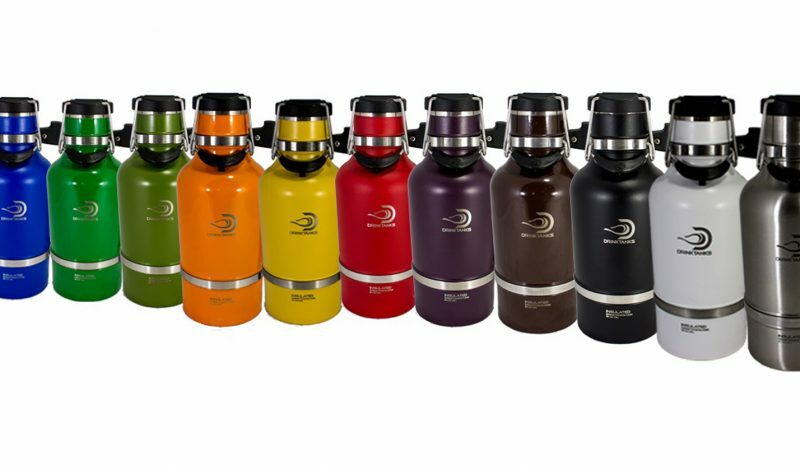 Utilizing a sturdy double bail locking system, DrinkTanks claims that their growler will keep your suds cold for up to 24 hours. With its double-walled vacuum insulation design, there’s a pretty good chance that the beer will stay cold for just as long. Also, if you’re looking to take it to the next level on the trail, check out their Keg Cap which allows you to replicate the benefits of a CO2 based tap system. Boasting their classic green enamel finish, Stanley-PMI’s 64oz Growler is an expected and welcome addition in this period of “outdoor growler growth”. Designed in the same vein as their other time-tested vacuum bottles and featuring an insulated flip-top lid, Stanley claims that their growler will keep your beer cold for up to 16 hours. All of the aforementioned growlers start at around $50, but may very well be worth every penny as they have the potential to provide you with years of effective, ecologically-responsible craft beer transportation. Important to note that some states only allow breweries to fill their own growlers or growlers with a particular warning label on them. This seems to have loosened up over the past few years in many states but it can’t hurt to check with your favorite brewery beforehand.